Working again on the sketchbook. These are some of the willow pages. 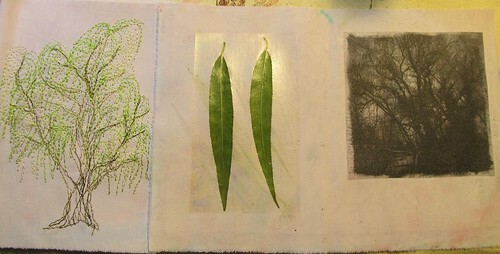 I was particularly pleased with the idea of enclosing real leaves, as well as prints from real leaves. The stitched portrait was especially fun to make, with all those sweeping lines of weeping branches. I need one more willow thing - the seeds are hard to come by right now, but I may be able to do womething with the bark, or a willow withy.